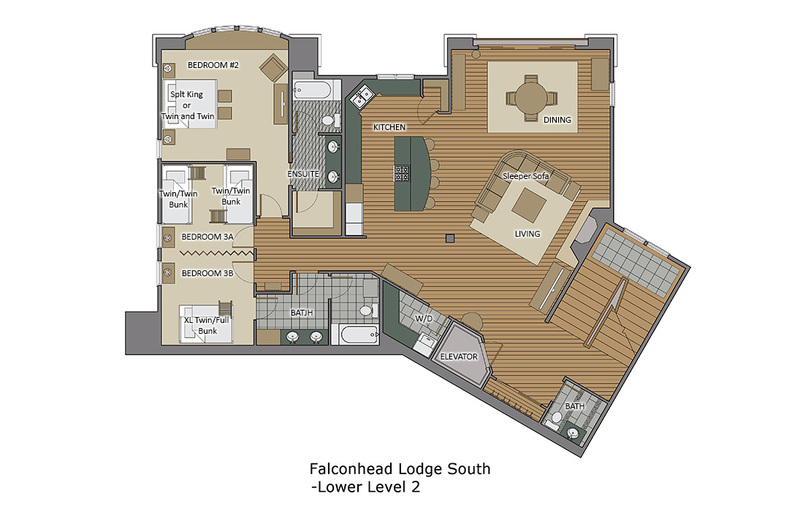 Falconhead Lodge - South offers spectacular views over the Yampa Valley. It is ideal for multi-generational family gatherings featuring two kitchens, two living rooms and a sports bar complete with pool table and flat screen TV. 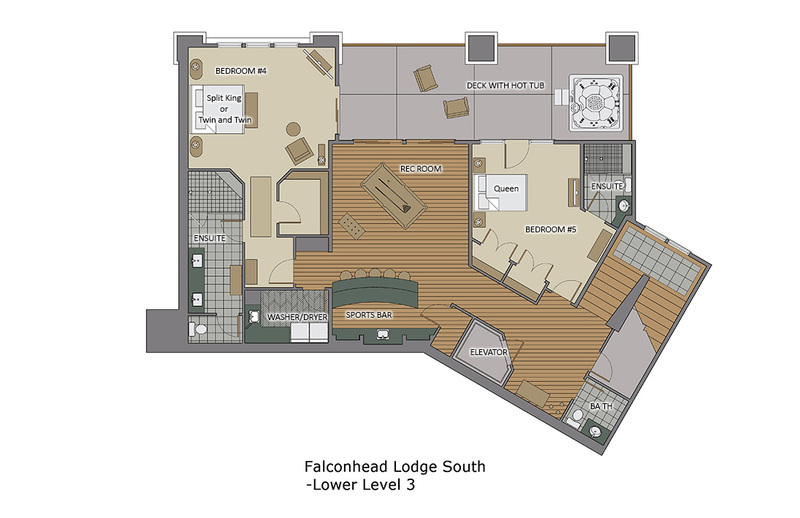 Falconhead Lodge holds a commanding position overlooking the Steamboat ski base area. The home is equipped with an elevator, however the spectacular mountain views are best enjoyed via the stunning open staircase constructed of timbers and steel which descends alongside a four story window. Enter this unique home from the top level with heated garage and plenty of space for coats and snow boots with built-in lockers. The main floor features the Great Room with vaulted ceilings, wide-plank rustic wood flooring, and an oversized stone fireplace. The open floor plan connects the living area to the gourmet kitchen and dining area. The large kitchen island invites camaraderie and a covered recessed balcony extends the living area into the great outdoors with a view of the slopes, gondola, and base area. There is also a kitchen bar with room for five more to sit. The upper and lower level kitchens feature professional appliances including full size dishwashers. There is seating for 12 at the main dining room table and room to seat 5 more at the kitchen island. Downstairs on the mid-level there is an additional kitchen, dining, and living area. Five bedrooms, spread out on three floors, allow ample room for a large group or various families. The master bedroom on the main level has a gas fireplace and private access to the covered balcony. On the mid-level, the bunkroom can be converted into two smaller bedrooms allowing for flexibility. A second master suite with private bath offers views of the valley and the Sleeping Giant mountain. There is a third master suite and queen suite each featuring private en-suite bathrooms. 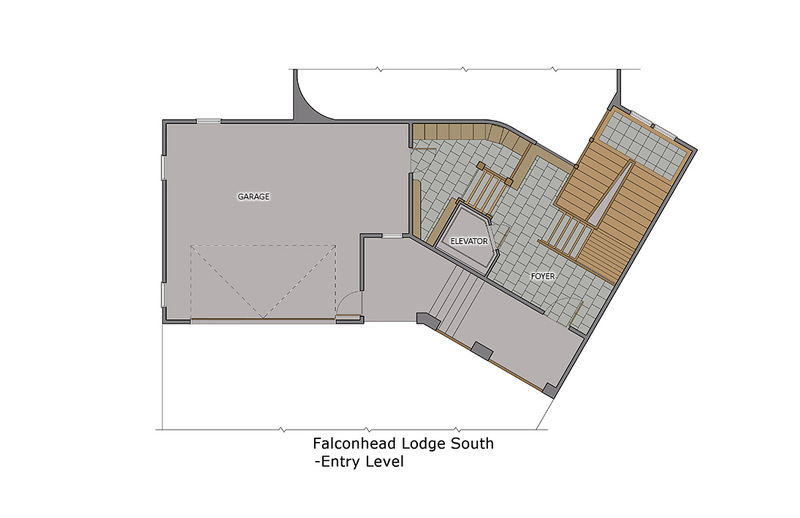 A third gathering area of sports bar/den and recreation room can be found on the lower level. The flat screen TV means you won't miss a play during a big game and rivalries can be settled over the pool table. The bar has a small refrigerator, a wine refrigerator, and small dishwasher. This level is home a covered deck with hot tub. Half bathrooms are conveniently located on all three living levels adjacent to living areas. Due to the impressive floor plan of 7,164 square feet, this home feels more like staying in your own private lodge rather than a vacation home. 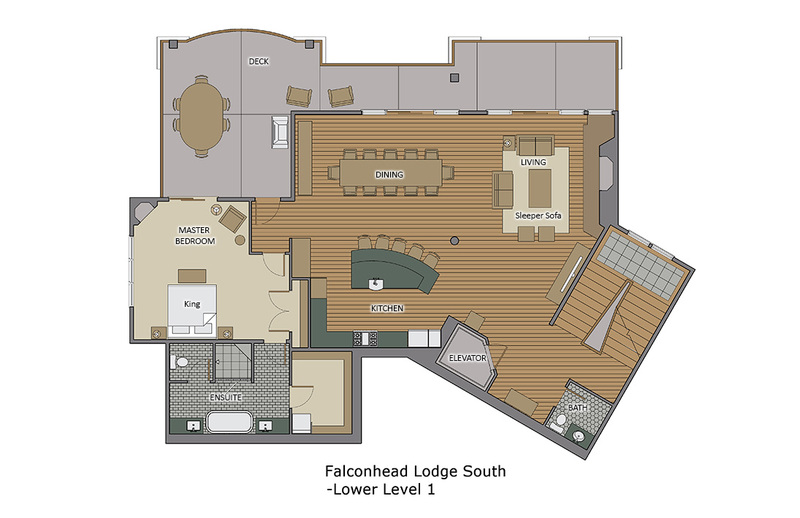 For larger groups of up to 32 guests we can also offer the option of Falconhead Grande Lodge, which combines the North and South sides of this spectacular home into one giant lodge of over 14,000 square feet. My family of 14 adults and 8 grandchildren rented the whole villa10 bedrooms. Everything was perfect, decor ,bedding, kitchens were perfectly stocked as was all necessities, tissue paper towels etc. weather was perfect we even spied a bear and a moose on the property. Perfect vacation, the city was awesome so much to do!